Celebrating childhood joy and the magic of music, our personalized xylophone ornament will be specially made for one unique recipient ... whether noise-making toddler or accomplished adult. Finished with sparkling glitter and red hanging ribbon, the artful personalized ornament is only found here ... yours alone when customized with name and year! Specify name; limit 1 line, 12 letters/spaces. Specify year; limit 4 characters. Resin. Christmas ornament measures 5" long x 2" high. 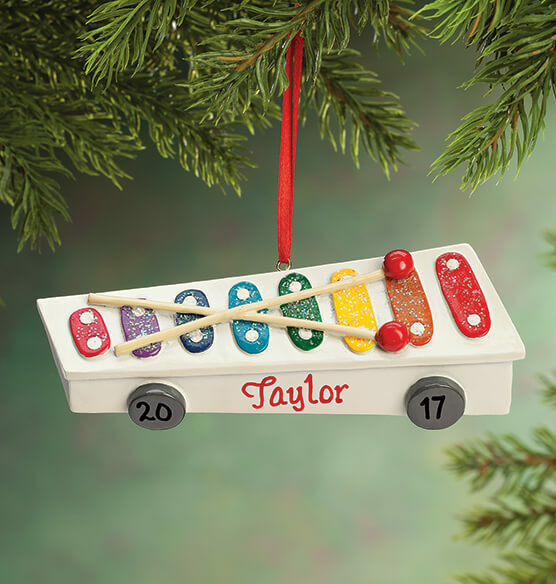 Where else can you find a Xylophone Ornament that's personalized? It's so colorful and beautiful! I know my daughter is going to love this ornament! Very well made! beautifully done ,but smaller than I thought .